Have you wondered to what extent you are living a life that is blessed? 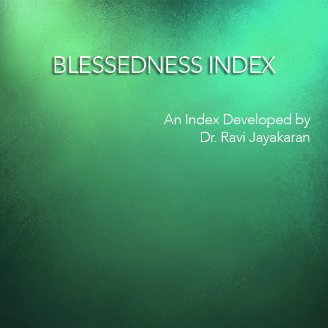 This Index will help you determine the extent to which you are blessed and if the level of this is continuing to grow in your life, because being blessed is an outcome. An outcome of the extent to which we have submitted to the Lord and in so doing, sown in the 8 areas of being blessed. 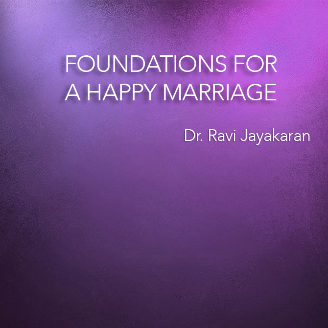 ​This is an application that was developed by Dr Ravi Jayakaran & Rohit Jayakaran for married couples to make self-assessments of how they are performing in building and strengthening the foundations of their marriage. It is a part of a Christian Marriage seminar that also looks at better understanding the areas in which Christian Marriages are under attack and how to prepare for this attack by strengthening the foundations of our marriages. Both spouses must do this exercise separately initially, followed by doing it together and then comparing the final individual scores and the points of variation from the assessment done together. ​The worldview of a community is the perspective through which it views and perceives its world. Worldviews significantly impact how the community understands their poverty and the way out of it. This is particularly true in the developing world where by default the community’s worldview is one that is fatalistic, devoid of hope and laden with the presumption that the ‘supernatural powers on high’ never operate in their favor and that they are always out to ‘get them’. As a result, their assumption is that the ‘powers that control their destiny’ do so in a way that exploits them oppressively, and that any attempt on the community’s part to counter their situation will result in a backlash from their ‘gods, spirits and ancestors’. Life is thus seen as a burden to be endured, with a futile purpose. This worldview offers little hope, and needs to be changed if an organization wants to transform that community. ​On the other hand, the biblical worldview holds that God, who is omnipotent and eternal, is also a loving God and has played an active role in all of His creation with which He seeks to actively engage. God not only interacts actively with His creation but has also made a provision for its redemption. Because He is a personal God, He cares intensely for all of His creation and is deeply concerned about its welfare, especially mankind. God’s Love is eternal and in playing an active role in the lives of humans, He is drawing them to Himself to give them fullness of life. God therefore seeks to work actively through His subjects who already know Him to ‘demonstrate and proclaim the good news’ about Him and what He seeks to do. The biblical worldview is that God wants mankind to restore a personal relationship with him, with each other and the rest of creation. Only when this happens can mankind experience the ‘Shalom’ that God has provided. This is what good and balanced Integral or Holistic mission does. For Christian program implementers, Holistic development involves understanding what the community’s worldview is and then addressing it with a correct biblical worldview so that through a balanced development strategy the community experiences shalom. 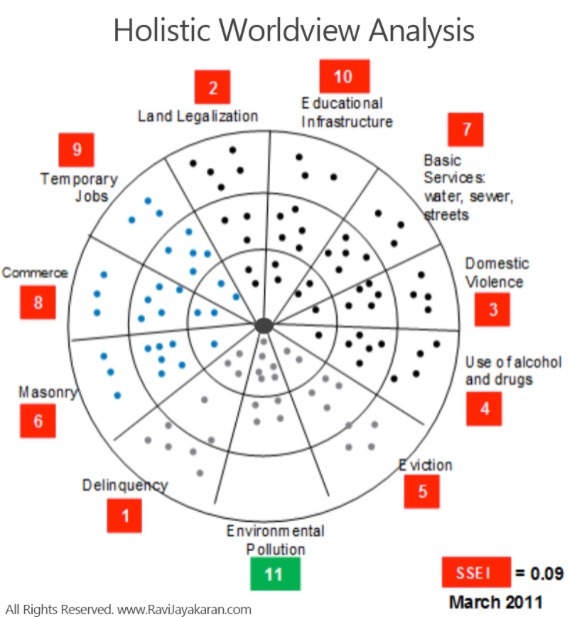 ​Over the years, I have worked on and developed a special participatory tool called the ‘Holistic Worldview Analysis’ or HWVA tool (See example of an actual HWVA from a poor community). This tool allows NGOs to carry out an analysis of the community’s worldview, understand its survival strategy and respond to those needs with active community participation. The uniqueness of this tool is that enables the development intervention to address both the ‘empirical’ as well as the ‘spiritual’ components of the development needs in a way that is balanced and Holistic. ​Empowerment can be defined as the process of being released to develop and grow to full potential. This is something that is talked about a great deal when talking about transformational development. But, how do measure this and establish a point score of how empowered we are, and subsequently even track the progress of this? Personal empowerment levels can be tracked by carrying out the PEI- Personal Empowerment Index. 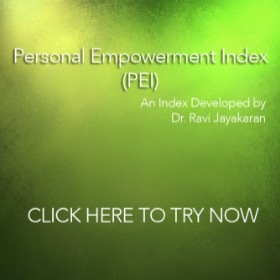 ​The PE Index tool was developed by Dr Ravi Jayakaran in the form of a simple participatory tool that measures the level to which an individual controls the 4 components that contribute to empowerment. 4. Level of control on one's micro political environment. ​This online self test can help you carry out a test to determine how empowered you are. ​The vision of every community pre-exists in it as its ‘survival strategy’. If we want to be effective, then we must design our intervention to be driven by the community’s vision. This will result in the program being sustainable, and the community will be empowered as a result. The program begins with participatory assessments allowing the community to articulate their expertise on their history, resources, challenges, and opportunities. 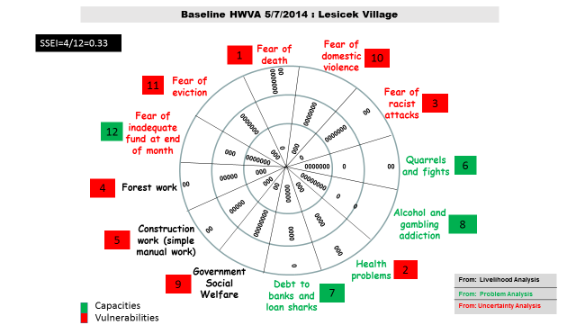 These assessments culminate in the use of a participatory tool designed by Dr Ravi Jayakaran called the Holistic Worldview Analysis® (or HWVA, pictured at the left) which is like a snapshot of the ‘survival strategy’ of the community, and gives insight into the specific interventions required for the development plan. The exercise uses another participatory tool developed by Dr Ravi Jayakaran called the Ten Seed Technique®. Each of the dots in the diagram represents a seed. Blue seeds are sources of livelihood, gray are uncertainties, and black are problems. The innermost circle represents what the community controls, the middle circle what outsiders (like NGOs, government, etc.) control, and the outermost circle is what is beyond the community’s control (The community usually assigns this ‘gap’ to the supernatural). ​Empowerment : The most important expected outcome of a transformed community is community empowerment evident in the interactions of community members (exhibiting equality, courtesy, and shared responsibility), quality of life experienced, and ability to control the survival strategy development plan. Ultimately developing a community collectively and working for a better future. The SSEI is a tool designed to track the progress over the course of the intervention. In the HWVA in this diagram, the red numbers represent vulnerabilities and the green capacities. By dividing the number of Capacities by the number of Capacities plus Vulnerabilities, a score, or SSE Index is produced. In this particular community, this score was 0.09 in 2011. Each year this exercise is repeated, and the new SSE Index score is plotted on a graph to track the progress of the community. Copyright (C) 2018-19 Dr. Ravi Jayakaran.